On November 9 of 1799 Napoleon overthrew the Directory and established the Consulate. It was a huge improvement because instead of a five-man executive and a chaotic legislature you had a feeble legislature and a three-man executive and Napoleon was the man. Well, it was a huge improvement if you were Napoleon. 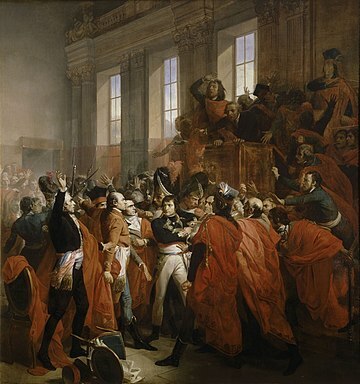 It’s called the Coup of Brumaire because in those days the French still had the new months the radical excesses of the Revolution had foisted upon them. It’s never a good thing when they start renaming months, even if “Foggy” is kind of a funny name for a month. And the result was a typically foggy French political arrangement. The legislature had one chamber that could discuss bills but not vote on them, one that could vote but not talk, and one that could do both but was secretly part of the executive and was appointed by it. So the executive was pretty much all powerful. And within it, guess who was in charge. Right. The guy who staged the coup partly because at age 30 he was too young to be a Director under the old system. I find the whole thing unfair because the Directory had itself gotten rid of the infamous Committee of Public Safety, ended the reign of terror by executing a few of its leading advocates including the egregious Robespierre, and tried to restore sanity to economic policy including ending the hyperinflation idiocy of the assignats. If ever a French government did not deserve to be overthrown, and frankly it’s a short list, it’s the Directory. There’s one humorous aspect to this whole business. Beyond the fact that French politics is almost always funny as well as alternatively infuriating and tragic. And that’s the thought of two other guys agreeing to form a triumvirate with Napoleon Bonaparte and having no idea they were patsies. It’s been done before, including with Julius and Augustus Caesar. And maybe the others were formidable characters too and it’s only with hindsight that their fate seems predictable. But here’s a challenge: Name either of Napoleon’s other consuls. I can’t either. But I Googled and they are, or briefly were, Jean Jacques Régis de Cambacérès, 1st Duke of Parma, and Charles-François Lebrun, duc de Plaisance. And perhaps neither was quite the chump he seemed, as Cambacérès wrote the Code Napoleon (not a good thing, but an impressive career achievement) and lived until 1824 and died peacefully, having outlasted Napoleon himself, while Lebrun later became “Arch-Treasurer” under the Empire which is a pretty cool title, and also lived until 1824.